I was in high school when I first saw Star Wars, sometime around 1996 or ’97 during a USA Network Thanksgiving weekend marathon. I can accredit that standard def, pan and scan experience to being here right now, typing this. Fed the usual movie fodder of an ’80s child, including Ghostbusters and Ninja Turtles, George Lucas’ saga somehow escaped me. It’s odd too, as a die hard gamer I played through all the Star Wars video games, the undeniably classic Super Star Wars and miserable yet somehow spectacular Rebel Assault on the Sega CD constant time wasters around here. At some point, Jurassic Park happened, opening my eyes to a new generation of movie mysticism. With a steady diet of ’50s creature features and Ray Harryhausen backing me, it was a natural evolution in an interest of special effects. Diving into the world of Hollywood trickery, one name will always come up: Star Wars. Phil Tippett, Ben Burtt, ILM; all of those are regulars. So, that fateful Thanksgiving changed everything, the eye opening model work, a Death Star assault that might be the greatest of all effects driven action scenes, and a cast so loveable, spiteful, and dominating, it sunk in. Grabbing at available blank VHS tapes, I dutifully set up the VCR to record Empire and Jedi the following days, disgusted at the thought that I would have to wait through a family dinner before catching the last chapter. But, so what right? Everyone credits one of the big ones for their start, whether it’s Star Wars, Jaws, Jurassic Park; every Hollywood filmmaker in their 30s to their 50s had their jaw split in fascination by one or all of those. I’m no different. I haven’t accomplished what any of those inspired greats have; I merely bring them down a few notches on the internet. Go me? What this is though is small slice of insight, because in all honesty, who in their right mind even reads a movie review about Star Wars? Is anyone on the fence because maybe the Death Star assault doesn’t hold up anymore? It’s doubtful. Maybe you’re here for the changes, understandably so, Obi-Wan’s goofy call to scatter the Sand People switched up, some loosely textured rocks blocking R2-D2’s view, and all of those Special Edition quirks you either love or hate. None of it really matters, because it doesn’t change what Star Wars is. A kid growing up, or maybe even in high school right now, is about to have their mind blown regardless of whether or not Dewbacks patrol Tatooine. Who knows? Maybe they’ll even run a digital holographic format review site long after we’re gone. Movie aside, this is what you’re here for, the Blu-ray debut of this beloved trilogy (x2 for those who count the prequels) brought to proper hi-def for the first time. Fox’s crew and certainly Lucas have spared little expense here, or so it seems, rendering the film stocks with a generous AVC encode that rarely dips under 30 Mbps. What does that encode get you? Mostly a clean, natural looking image that will dazzle in its available detail. Those smaller touches, stuff like individual hairs on Chewie, the distinct reddish tint to the eyes of Vader’s mask, the cloth of the Empire’s standard issue uniforms, brilliance of the creature effects, and exquisite detailing of the model work are all evident (and captured in a run-on sentence). Even finer things, including facial detail in close or in the mid-range, is outstanding on more occasions than is typical for a film this vintage. You can see the work being done to pull these subtle touches out for the first time. Colors feel warmer than before, flushing flesh tones with a bit of red heft yet never offending the naturalist color palette that has carried this film through the ages. Dusty Tatooine is afforded additional depth and intensity, the cooler grays of the Death Star meeting rooms unaffected. Black levels aid in the push for an generically phrased “eye-popping” visual intensity, the black cloak of Vader and the expansiveness of space generating all this transfer needs to impress. It comes at the cost of some crush, adding a bit of bleakness to the garbage compactor escape, appropriate considering the light (or lack thereof). Resolved as it is, the grain structure isn’t without problems. Those desert scenes on Tatooine as R2 and 3PO carry an obviously static structure, stranger still as it swarms around the mobile R2-D2 at 9:21. Shots of the Stormtroopers searching the area minutes later will be noticeably static, although at no cost to detail. Maybe it was the clean-up for a deleted scene, but the added sequences where Han meets Jabba in port is probably the worst thing that will happen to this disc. Characters surrounding Jabba are pitiful in their definition, notably processed, and certainly suffering from a case of overzealous grain reduction. A handful of scenes later will carry that same filtered look, and that’s not referring to those shots pre-wipe edits. Those still carry the same natural degradation of the era. 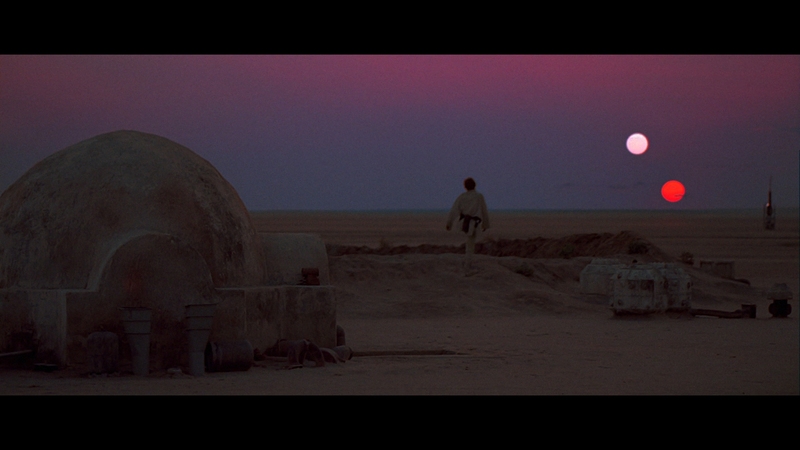 Whatever the faults are, Star Wars has been preserved better than some of the other quintessential classics. Negatives for the likes of King Kong and Citizen Kane are long lost, and yet here’s Star Wars, negative and all, without a single scratch or speck. That’s a more impressive feat when you consider the dated optical work that required multiple passes, not fixed by restoration or merely replaced by CGI. Whatever the case, it’s all led to this, and the wait was totally worth it. Lucas and company remaster the audio for a booming 6.1 DTS-HD mix, those famous complaints that stuck with the DVD editions taken care of here. John Williams score is no longer completely lost during the initial Death Star drop, although it’s still a bit dim compared those original edits. Whatever the case, much of A New Hope sounds new, not in the sense that effects were replaced, but the fidelity carries a purity films of this age could usually only dream of attaining. The theme blasts during the opening crawl, pitch perfect as those heavy drums pound on the sub and those trumpets blare with sparkling clarity. A Star Destroyer will rumble overhead, panning to perfection, the music swelling to compensate. To be clear, the bass has always sounded a little artificial, a bit rumbly and lacking the tightness afforded to something a little more modern (the DVD was the same). Purists be warned, while the rest will simply sit back and be astounded with modern restorative techniques. The final Death Star run is as reference a 1977 film as you’ll find, “turbo lasers” hammering the low-end during their close-ups, and Porkins goes down in a sea of flames worthy of such a low-end jolt. Ships pan to the sides, leave the center freely, and pass overhead where needed. Bits of that epic Death Star model whip by, the air leaving a trail the added surround channel can handle. This isn’t a mix focused squarely on action though, the canyon R2 will find himself in before the Jawa attack providing an alien ambiance as creature calls echo. The Cantina will come alive, the music oddly heavy towards the left of the soundfield, while the chatter envelopes each speaker. Prior to launching the final assault, the Rebel hangar is swarmed with clanking and nervous voices. Dialogue will be the sole downfall in terms of fidelity, certainly taking an obvious hit as Luke works on R2 and 3PO for the first time. Other notable dips include the garbage compactor, these faults more or less issues of the day than this disc. Restoration has its limits. The New Hope disc itself comes with two commentaries. George Lucas, Carrie Fisher, Ben Burtt, and Dennis Murren populate the first, the second all archival interviews pieced together. Quotes are pulled from 21 different contributors, enough to get a sense of how this all came together from varying viewpoints. The rest of New Hope’s extras are on a separate disc in the box set, ready to be reviewed at a later date in the interest of being as thorough as possible. The score reflects the film’s disc only.